Paul Cohen’s deep passion for journalism began after his father convinced him to take a class in the subject when he was a freshman in high school. Paul who will begin his senior at Farmingdale High School in the fall, has worked at his school newspaper “The Paper Lion” ever since. 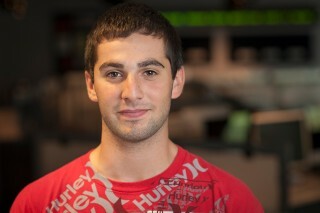 First as a writer, then as a sports editor during his sophomore year and last year Cohen was managing editor. Next year Paul, 16, said he will become the editor-in-chief. He said he has also received encouragement from his journalism teacher at Farmingdale to pursue the field. Paul also said he has an interest in business and will be taking Advanced Placement Economics and Calculus courses during his senior year. Still, by participating in this year’s Robert W. Greene Summer Institute for High School Journalists at Stony Brook, Paul said he hopes to get a better idea of whether journalism is the career for him but he is most interested in newspaper writing. Aside from Paul’s journalistic aspirations, he also has hobbies. He plays for his school baseball team the “Farmingdale Dalers” as a second baseman. In addition, Paul loves music with his favorite genres being hip hop, rap and rock. He said he has yet to meet a working journalist but if he had the opportunity, it would be SNY field reporter Kevin Burkhardt of the New York Mets.